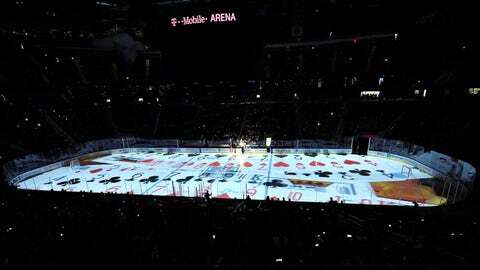 There’s still a lot of mystery surrounding Las Vegas’ new NHL expansion franchise. We know that that the team will officially join the league with its inaugural season in 2017-2018, but we don’t yet officially know what their name will be, what their logo will look like or who will be on the roster. We’ll find out a few of those things very soon, though. The franchise is holding an event on Nov. 22 in which they’ll reveal the team name and logo to a crowd located in the plaza outside T-Mobile Arena, the team’s new home on the Strip. Las Vegas team owner Bill Foley and NHL commissioner Gary Bettman are reported to take part in the unveiling. It’s long been rumored that the team would incorporate "Knights" into the name, as Foley is a graduate of the United States Military Academy at West Point. Last month, Foley told ESPN’s Scott Burnside that the name would be the "something Knights" with a color scheme that most likely included steel gray, gold and black. In August, the registration of several domain names indicated that the ownership group was seriously considering calling the team the Desert Knights. Whether that is the moniker that they ultimately decided on, we’ll have to wait a few more weeks to find out.